People who have spinal problems have them because of a genetic tendency or susceptibility they have towards spinal disease. The spinal column is one organ and people who have lower back problems frequently will develop, or at the same time have neck problems. Spinal surgery should be reserved for nerve compression and intractable pain that impairs a patients everyday life and functionality substantially. Spinal surgery changes the biomechanics of the spine and frequently leads to further spinal surgery. The mainstay in the treatment of back pain therefore is prevention. This chapter aims to explain how to go about putting as little strain on your spine as possible. Do not sleep on your stomach. It is better to lie on your side with a pillow between your knees, preferably on your better side. You may also lie on your back with pillows under your knees. Make sure that your mattress provides proper support. When you roll to your right, bend your left knee and keep your right leg straight. Press with your left hand against your left knee. Push away with your left leg to roll. It is important to remember that when you roll from your back to your side, that your shoulder and hip must move together (log rolling). If you have to wear back support (corset), it must be in position before you continue. Roll on your side as in the step above. Bend your knees and move your feet over the edge of the bed. Press up with your elbow to lift the upper body while letting your legs down the bed until you sit over the edge of the bed. Glide off the bed until your feet touch the floor and stand up straight. The first time you stand up after surgery, your physiotherapist must be with you. Sit over the edge of the bed or stand next to the bed for a few seconds and take a few deep breaths to avoid dizziness. Figure 1.6 These photos demonstrate how to get out of bed. Note how the top picture shows that you should use your left hand to support yourself when you are lying on your right side. Bend your knees and move your feet over the edge of the bed. Press up with your elbow to lift the upper body while letting your legs down the bed until you sit over the edge of the bed as demonstrated on the opposite page. Then stand up straight, using your legs without bending your back. When sitting, the chair you are using must have proper back and arm support. To stand up, move forward on the chair. Push up with your arms and use your strong thigh muscles to stand, while keeping your back straight. Figure 2.6 These photos demonstrate how to sit. Note how the top left picture shows how to sit properly and the other two photos show poor posture that increases the strain on the spine and specifically the joints and the intervertebral discs. Do not stand for long periods at a time. Do not stand slouching with the lower back arched. Try to stand with your back straight, head up and chin in. The use of a footstool helps to relieve swayback. Figure 3.6 These photos demonstrate how to stand. Try to stand with your back straight, head up and chin in. The use of a footstool helps to relieve swayback and relieves the pressure on the lower back. When you get in the car, first sit on the seat with your feet still outside the car on the ground. Then swing your legs into the car. Remember to stabilise with your core muscles. The same applies for when you want to get out of the car. First swing your legs out, and then stand up. Remember to stabilise with your core muscles. When you have to drive long distances, it is wise to stop every 1-2 hours and just walk a few times around the vehicle before you continue on your journey. 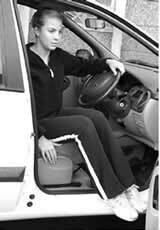 Figure 4.6 These photos demonstrate the correct driving position and the correct way of getting in and out of a car. The picture on the left demonstrates how to enter the car. Note that you should sit down with your back straight and your knees together. The swing your legs into the car while you tighten your tummy muscles. This puts the least strain on your back and is especially important if you have diagnosed abnormality of your intervertebral discs. If you have had recent spinal surgery it is advisable to lie down at least at an angle of 30 degrees in the passenger seat by reclining the front seat. The picture on the left shows how to get into and out of the drivers seat. It is important that you sit down with your back straight and your knees together and then swing your legs in. When getting out of the car the legs are swung out first and then, with the back kept straight, you should stand up out of the car. The bottom picture demonstrates how you should sit when driving. It is important to check with your doctor or therapist on when you could drive and when you should not. Note that the back is kept straight at all times. If your car seat has lumbar support, it is important to engage this as well. 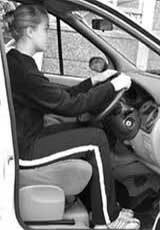 Note that the position of the arms are such that the elbows are slightly bent and that you should be able to reach the steering wheel without effort. Figure 5.6 This photo demonstrates the incorrect way of getting out of a car. Note how the back is bent and how the model hangs on to the steering wheel. Use your strong thigh muscles to lift, not your back muscles. Place feet apart and firmly on the ground. Bend your knees and not your hips. Face the direction that you intend to go. Hold the object close to your body. Lift the object by straightening your knees and hold your back as straight as possible. Do not lift objects above your head. Put the object down the same way you picked it up. Try not to carry unbalanced weights. Figure 6.6 These pictures demonstrate lifting. The top picture demonstrates the correct way of bending and lifting. Bend your knees and not your hips. Face the direction that you intend to go. Hold the object close to your body. Lift the object by straightening your knees and hold your back as straight as possible. The bottom picture demonstrates the incorrect way of lifting. The amount of strain that you place on your lower back with this maneuver is extremely high. Figure 7.6 Bend your knees and not your hips. Face the direction that you intend to go. Hold the object close to your body. Lift the object by straightening your knees and hold your back as straight as possible. Walking and exercise: If your back is extremely painful, try to avoid going up and down stairs. Walking and swimming are strongly recommended. Walk as much as possible, without overtire yourself. Do not engage in competitive sports for the first 3-6 months. Ask your doctor when you are allowed to start with your specific sport. You are not allowed to do sit-ups ever again. Do your exercises daily as prescribed by your physiotherapist. Daily activities need to be done correctly for the rest of your life. Equipment: All equipment should have long handles so that you do not have to bend down too much. 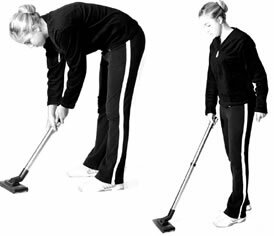 Vacuuming: The vacuum cleaner should be pushed with short sweeps rather than long lunges to avoid excessive strain on your back. Figure 8.6 All equipment should have long handles so that you do not have to bend down too much. The vacuum cleaner should be pushed with short sweeps rather than long lunges to avoid excessive strain on your back. Do not reach for objects on high shelves, rather use a step ladder or get some assistance. Arrange your kitchen so that articles/objects that are used daily are within reach. If you need to stand for long periods of time such as when ironing or at the kitchen sink, stand with one foot on a box/footrest. Never bend forward with your knees straight when reaching for anything out of lower cupboards. 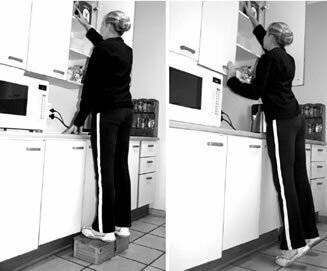 Figure 9.6 Do not reach for objects on high shelves, rather use a step ladder or get some assistance. Arrange your kitchen so that articles/objects that are used daily are within reach. In the photo on the left the model has used a footstool to reach a box on a high shelf - this is the correct way. The photo on the left demonstrates the incorrect way of reaching for an object on a high shelf. Figure 10.6 Never bend forward with your knees straight when reaching for anything out of lower cupboards. Make sure that you bend in the correct manner as in the photo below. Try to arrange your cupboards so that the cupboards that you use the most is at waist height and above. 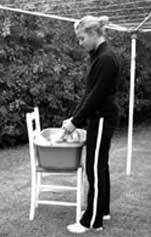 Figure 10.6 It is important that you keep your back straight when doing chores that involve standing, like ironing or doing the dishes. 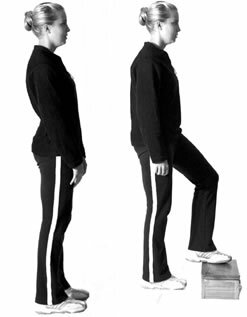 If you need to stand for long periods of time, stand with one foot on a box/footrest. Never carry clothes in a heavy laundry basket, rather use a small basket. It is better to make several trips instead of staggering under a load of heavy wet washing. Do not bend or stretch to hang the washing. Put the clothes basket on a chair/table and use a step ladder to hang the washing. 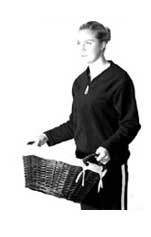 Figure 11.6 Never carry clothes in a heavy laundry basket, rather use a small basket. It is better to make several trips instead of staggering under a load of heavy wet washing. The top picture illustrates the incorrect way and the bottom picture the correct way to carry laundry. Figure 12.6 Do not bend or stretch to hang the washing. Put the clothes basket on a chair/table and use a step ladder to hang the washing. The top picture illustrates the incorrect way and the bottom picture demonstrates the correct way of hanging the laundry to dry. Your back pain will be aggravated by bending forward when you need to tuck in the sheets. The best way to tuck in the sheets would be to do so while kneeling at the bedside. ever attempt to turn the mattress by yourself. Ask for assistance. Figure 13.6 Your back pain will be aggravated by bending forward when you need to tuck in the sheets. The best way to tuck in the sheets would be to do so while kneeling at the bedside. ever attempt to turn the mattress by yourself. Ask for assistance. The top picture demonstrates the correct way and the bottom picture demonstrates the incorrect way of making the bed. Avoid sudden or jerky movements. Try not to hold any position for too long. Do not wear high heels for long periods of time. It is better to shower than to bath. If your back aches, try to relieve the pain before it gets worse. Apply any other form of heat to painful area e.g. hot water bottle or a hot beanbag. Curl up in the fetal position and hold for 5 minutes. Practice proper back care in your everyday life!